These pool and spa heaters feature a flow switch to prevent operation when there is no water flow. An all stainless steel tank for long life and corrosion resistance is also standard. 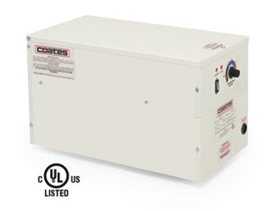 Available in single phase (240V) and three phase (208V, 480V, 600V) configurations with 12, 15, or 18 kW outputs. These pool and spa heaters feature a flow switch to prevent operation when there is no water flow. An all stainless steel tank for long life and corrosion resistance is also standard. Available in single phase and three phase configurations. Along with the same features as our 12-18kw heaters, our 36-57kw heaters now include a digital thermostat for more precise control of pool water temperature. Available in 36-57kW and from 220-600V. 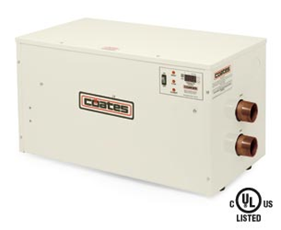 The Coates model PHS-CN heaters are designed for use in pools and spas that use chlorine generators as their sanitizing system. The heater’s Copper-Nickel tank and Titanium heating elements offer increased corrosion resistance in pool and spa water with a maximum salt concentration of up to 3500ppm. Available from 12-57kW and from 220-600V. 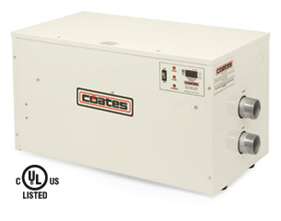 Designed for high capacity commercial pool installations, Coates heaters incorporate design features that increase service life, dependability and provide ease of servicing. Corrosion resistant all stainless steel tank surfaces and low watt density incoloy elements mounted on four-bolt stainless steel flanges provide long, trouble-free service life. 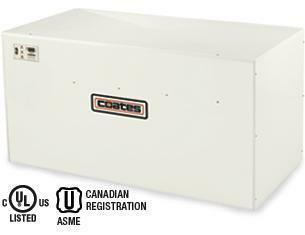 All electrical components are easily accessible under the conveniently hinged cover. Terminal blocks are provided for simplified power supply wiring.